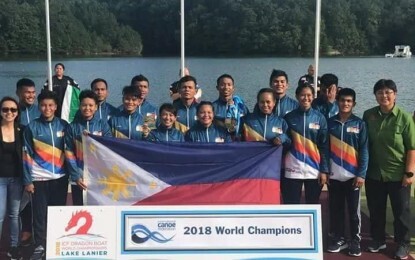 The Philippines quickly snatched two gold medals in record-setting fashion during the opener of the prestigious 2018 ICF World Dragon Boat Championships at the Lake Lanier Olympic Park here. The national paddlers from the Philippine Canoe Kayak Dragonboat Federation (PCKDF) ruled the 10-seater senior mixed 500-meter event on Thursday (Friday, Manila time), defeating race favorites Hungary and host United States by a significant margin. With drummer Patricia Bustamante and steerer Maribeth Caranto leading the way, the Filipinos clocked 2 minutes, 7.5 seconds to improve on their bronze-medal finish in the same event during the 2016 world championships in Moscow, Russia. Arriving second were the Hungarians, who timed 2:11.36 in a narrow finish to nip the Americans (2:11.86) for the silver medal in the biennial meet, featuring the best 16 countries in the world of dragonboat racing. “They really wanted to prove something out there and they never lost focus despite the strong opposition,’’ PCKDF president Jonne Go said. The Filipinos struck a second gold medal just a few hours apart after dominating the 20-seater senior mixed 500-m. race again at the expense of Hungary and the Czech Republic. They timed 1:52.58, impressively beating their previous race-winning clocking by 3 seconds two years ago in Moscow. The Hungarians clocked 1:55.09 and the Czech Republic placed third (1:55.14). “We never doubted the team’s ability to win. Once again, they showed the world that we Filipinos are world-class in this sport,” Go For Gold’s Jeremy Go, who helped bankroll the participation of the PCKDF with the Philippine Sports Commission, said. It was a rejuvenating feeling for the Pinoy paddlers after they went home without a medal in the recent Asian Games in Indonesia where the organizers veered away from international standards by using shorter but heavier boats. Head coach Len Escollante said the Philippines is on track to capture a third gold medal on Saturday when the national paddlers, led by Hermie Macaranas and Ojay Fuentes, compete in the 10-seater men’s 200 finals.